I, for one, need a little break from the insanity in the Church, and from the rising river of raw chunky sewage and its stultifying miasma that is the “mainstream media.” So, here is my break. My oldest son entered the Coast Guard boot camp with right out of high school last year. He is smart, but needs to sort himself out. What better way to do it than as an independent young man, doing a man’s job on a small icebreaker. The USCG cutter Wire (WYTL-65612) is one of a class of 65 ft, 74 ton harbor tug/icebreakers, all commissioned in the early 1960’s, and many of which are still out there breaking the ice in the dark and screaming cold of the blizzarding winter, and doing odd jobs of all sorts during the smiling summertime. The good ship Wire has needed a couple of drydock periods this spring and summer, she had a fair amount of damage. I guess if you were 55 years old and bashed your head through walls for a living, you’d need some drydock time prior to entering the next head bashing session as well. So here she is, returning from her most recent drydock in Rhode Island last week. They left RI, came down the coast (through the remnants of Florence) through NY harbor and finally up the Hudson to homeport in Saugerties, NY, a few miles below Albany. The photos are by Glenn Raymo, who does a fair amount of maritime photos, here and here, for example. And so, I offer the USCG Cutter Wire, making her way up the Hudson back to USCG ANT Saugerties this past week. Looks good with her fresh paint job! I like all things that float, big and small. I guess that’s why I stuck with the Navy for twenty years. 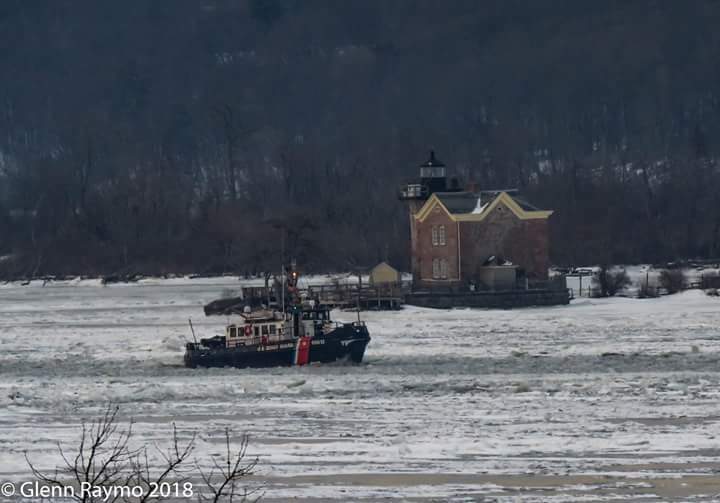 Lest you think it’s all fun and games, here’s a picture from this past January, taken at dawn, 10 below and a 20 knot wind, as the tough little ship and her crew of seven head out past Saugerties Light to bust a tow boat and her fuel oil barge from the ice. Truth is, I’m proud of Will. That’s it, in a Nutshell.